Gennifer Albin - Author: #JoinTheAgenda Winner & Final Challenges! #JoinTheAgenda Winner & Final Challenges! The Pin It To Win It winner is M. A. Patterson and his board! Congratulations! You did an amazing job. Special Mentions for Billie and Sarah for their amazing boards (Sarah's & Billie's)! You girls did an amazing job! Adelice could use all those items to help her survive on the Surface. Thank you everyone for participating, I hope to see you in the next challenges! The final two challenges will be ongoing until October 29th (Altered's release date!). Anyone can enter these. Don't forget that the Art Scholarship and Tattoo Scholarship are both open until October 29th as well. We've been getting some really great entires but we could always use more! If you want a chance to win a $100 cash scholarship, send your tattoo design to genniferalbin@gmail.com or your Artistic entry (can be a sketch, a song, a poem, a short story -- anything really, it's up to you!) 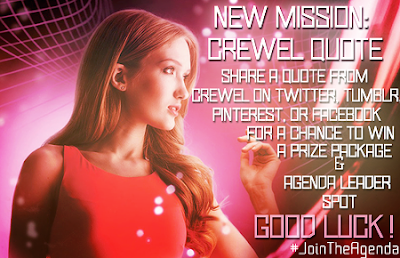 either tweet a link to your entry using #JoinTheAgenda or email it to genniferalbin@gmail.com. Share any quote from Crewel on Twitter, Tumblr, Pinterest, or Facebook using the hashtag #JoinTheAgenda for a chance to win one of the final Altered Prize Packages! You will also win an Agenda Leader spot. Agenda Leader's get Altered T-Shirts and their own prizes as well. All entries will be entered into random.org and a winner will be selected randomly. This means the more you share Crewel quote entries, the higher chance you will have to win! @TheCrewelWorld will either favorite or retweet all your entries (or tweet them for the first time if they were entered using one of the other social media sites). It is recommended that you follow @TheCrewelWorld but it is not required. The Challenge is opened officially NOW! Good luck! This #JoinTheAgenda challenge will be slightly more difficult than the last. Write a journal entry about a scene that happened in Crewel. It could be from Adelice's POV or one of the other characters in the story. Share your entry online somewhere. Either on your blog, on tumblr, on facebook, or in the comment section of this post. If the journal entry is on your blog or somewhere else, please leave a link in the comment section or tweet a link using the hashtag #JoinTheAgenda. The Agenda Leaders will be selecting the strongest entry. There's always a chance that there will be so many great entries that there may be multiple winners though! Good luck everyone and thank you for participating!